Spending hours a day staring at screens can hurt more than just your eyes. 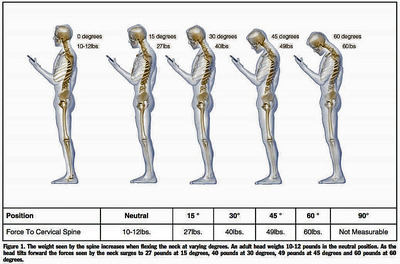 A new study from spinal surgeon Kenneth Hansraj shows that bending over your phone while texting can cause significant stress on your spine, which could theoretically cause damage that would eventually require surgeries. The graphic above shows how many pounds of pressure are put on your spine as you bend your head forward. The longer you spend with your head tilted forward, the more damaging it could be to your spine. As you can see, bending over at a 60-degree angle puts about 60 pounds of pressure on your spine. To be fair, this could also apply to bending over a book or a magazine or anything else that you’re staring at for a prolonged amount of time. But the study does note that people spend an average of two to four hours a day with their heads tilted forward staring at a smartphone or other device. This translates to 700 to 1,400 hours per year of extra stress on your spine. 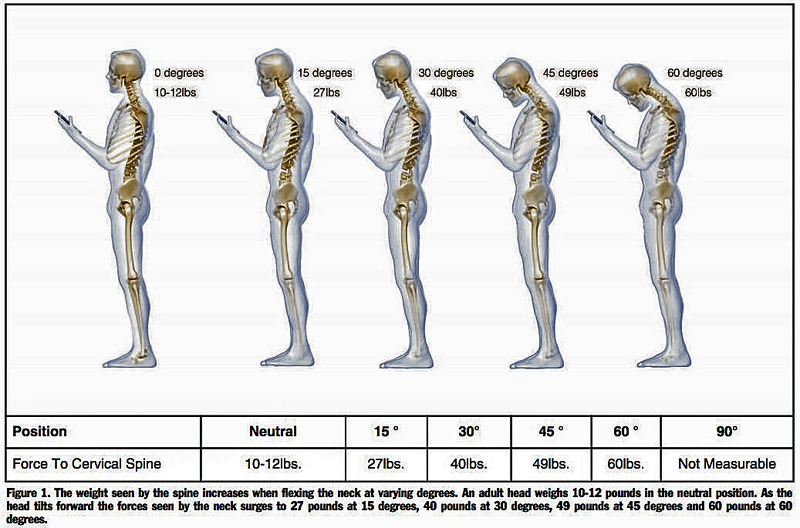 To avoid future damage, the study recommends keeping your head held up straight while you’re looking at your phone and minimising the amount of time you spend hunched over. Good posture has benefits other than just saving your spine from damage. Hansraj notes in the study that previous research has found that people with proper spinal alignment — and what’s known as “power posing” in particular — report increased feelings of power, increased tolerance for risk-taking, and decreased levels of cortisol, a hormone primarily associated with the body’s response to stress.